It sticks in my craw to see the whiney voiced John Key front stage at ANZAC day in Gallipoli, when the way he chose to recognise the 100 year anniversary of that terrible event was to begin a personal campaign to change the NZ flag. Especially when the true patrons of ANZAC, the Returned Services League, has publicly opposed the flag change. 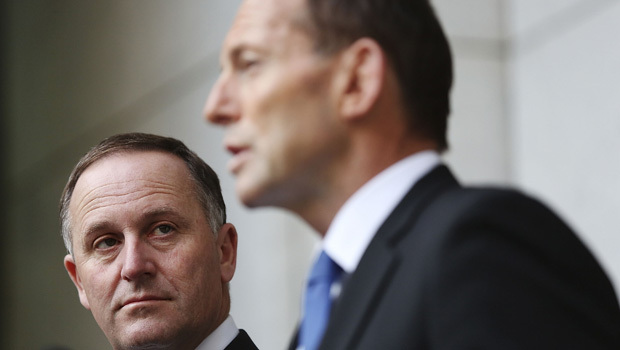 Key’s address was noticeably weak when compared to those of Tony Abbot or Prince Charles. He does not have the gravitas for such an occasion, and neither do I think he has the personal conviction. He’s a first generation NZer. None of his forbears died at Gallipoli. And of course he’s a self confessed Progressive anyway, which means none of the traditions we Conservatives value have any meaning to him. Its why he wants to change the flag. Its why he refused to act on the anti-smacking referendum. Its why he led the charge with the Labour party to redefine traditional marriage. And its also probably why he didn’t sing the National anthem on this occasion. When everyone else was singing it, including Australian PM Tony Abbott who sang both the Australian and the NZ anthem. Key stood stony faced and silent. Key has always been a lightweight, and he looked every bit of one at the ANZAC ceremony, completely lacking the gravitas the occasion demanded and far out of his depth. That jokey blokey stuff can only go so far really, and then it begins to wear a bit thin. Key looked threadbare at Gallipoli. I think he’s going to look even worse when he arrives back. Nats have to get some smarts, or its time for a split in the party. Of course. He was playing to his socialist constituency. So right.He seems to have no connection with our land, our history, those things that are part of us who care , whose heart is in New Zealand.I hoped he might learn the difference between a logo and a historical symbol while he was away but guess I am dreaming. Come on Red you could be a little bit charitable here, he probably did no know the words. I certainly do not know and never will know the Maori version.Nor do I and I never will know the sign version. A 7 letter word that starts with “B”., & a clammy limp handshake. He is always going to stand apart from the normal red-blooded naturally affectioned crowd. Anytime. A sickly white liberal. Thats Key. We cannot allow him to consign our flag to the dustbin. I have always maintained that key is a Trojan Horse. Certainly a bit effeminate and creepy. Have never shaken his hand but I imagine it would be a bit limp wristed.. I would not feel comfortable with him around my daughters. He will, like many today, be unable to say the word “God” because that puts someone above them. Clark was the same I gather. You’ve hit the nail on the head.Both Key and Little and many members of parliament are atheists, so the word “God” in the national anthem is repulsive to them. Atheism is the religion of the communism.